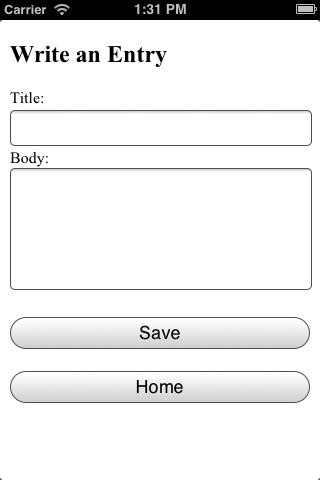 When destinationType.FILE_URI is used, photos are saved in the application's temporary directory. Developers may delete the contents of this directory using the navigator.fileMgr APIs if storage space is a concern. Here’s the home page - a simple list of entries with the ability to view an entry and add a new entry. This wrapper class is used by index.js, which handles my views, adding and requesting data, etc. Basically, index.js acts like a controller in your typical MVC setup. I’m not going to share all of that file (to be clear, everything is shared via a Download link below), but here is an example. So - nothing too terribly complex. I took this as a starting point (in the zip you can download, this may be found in www1) and then began to integrate camera functionality. 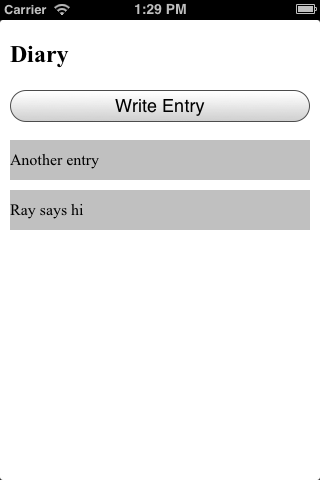 I started by adding a new button to my entry field. This button, “Add Picture”, would request the device camera and store the resulting image in a hidden form field. I began by using FILE_URIs even though I knew it would be an issue with iOS. In almost everything I do I start slowly, take baby steps, and try to build one thing at a time. So with that in mind, I went ahead and just built it in. Note that I’ve updated my form to include a preview and the entry detail view (not shown here) has been updated to display it. Ok, so at this point, the core functionality is done. (You can find this version in the www2 folder.) I can add and view content (I didn’t bother with edit/delete, but that would be trivial) and I can use the device camera to assign a picture to a diary entry. Now to look into the bug. I made a decision at this point. 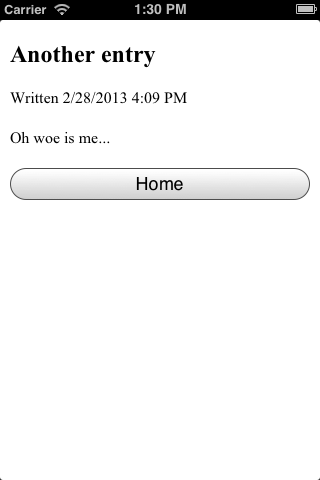 Even though it felt a bit wrong, I decided I’d write code just for iOS. I figured the ‘forked’ code would be pretty small and therefore it wouldn’t “pollute” my code too much. This smells like one of those decisions I may regret later, but for now, it is what I’m going with. 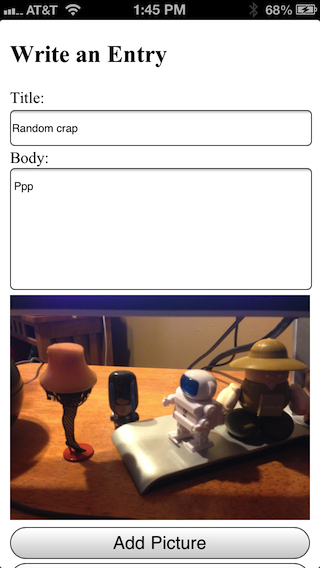 I began by sniffing the device using PhoneGap’s Device API. Nothing too complex here. If I detect iOS, I request the persistent file system and remember the root directory it gives me. Next - before I store the Diary entry, if I am on iOS, I simply copy the image over.